Two recently released poetry collections illuminate the range and variety of writing that can be accomplished through the use of found language. These collections differ widely, both in concept and in understanding of what can or should be done with found language; together, they continue the debate around appropriation and the nature of creativity. 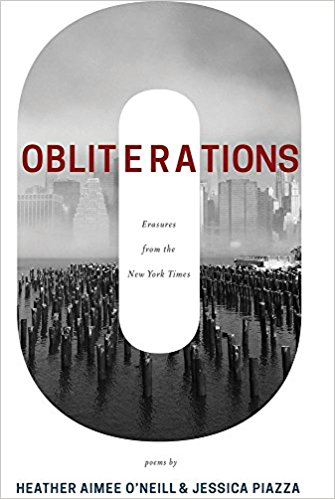 Obliterations, a full-length collection by Jessica Piazza and Heather Aimee O’Neill, is classic erasure. Piazza and O’Neill collaborate to create dual erasure poems sourced from The New York Times over a three-year period. In keeping with fair use rules, and as is standard in found poetry, all sources are meticulously cited. Piazza and O’Neill selected poems from assorted sections of the paper/website, and each privately created her own erasure from the same piece. Word order is maintained, as is tense and conjugation. The writers establish a distance from the source material by withholding the actual erasure imagery; we do not see the redacted writing, only the poem that remains, in the form the writer creates. From chatty, accessible articles, the two writers craft challenging and varied pieces. The opening poems are sourced from an article in the real estate section; one poem is a concise eight lines, while the other, eschewing line and stanza, spills onto a second page. “That Crumpled” relates the story of a human black hole, and “Slow Return” narrates a character who is finding renewal in middle age. These are markedly different poems, a theme that continues throughout the collection. Piazza and O’Neill elect not to indicate who authored each piece and, given the constraints of the form, it isn’t possible to tell. Occasional shared titles or the repetition of a charismatic word – “tryst or incantory” – serve as tells, but from there on the work stands on its own. At no point do two distinct voices emerge. Rather, the poems often possess a staccato voice, which can be characteristic of erasure. “To fly was the cause, was the mission, was the explosion and crash. She said:/I’m cut. She said: broken.” Or, “Two women. One came./A cosmonaut trained in weightlessness”. The voice can feel stilted and inaccessible at times, but this is less a glitch and more a feature. Erasure frequently results in abrupt changes to structure and content. This strict adherence to form can be more difficult to discern in pastiche or cento. It also reminds us of the virtuosity needed to craft a meaningful narrative under such tight limitations – this is work, and more so when we are given two poems from the same source. The poems do manage to transcend the ties of erasure, though, sometimes delightfully. An article about cancer in the health section is transformed into a lyric poem that is nearly a triolet. The first few lines from “Living Dark” do not read remotely as found poetry. “A slant of light bifurcates the night, light slivering/the night, shaft of light and time, stalled sight./ Waking in the dark, dark night I wake/tense as a verb. Ghastly night, a heightened/ bitterness. Hard not to feel, or fail.” It’s beautiful, winding, and ghostly. Later in the book we are treated to “Chicken Ensues”, a hysterical romp through the city by an army of feathered, clucking invaders. “Chickens decamping in New York/to feed on the energy of admirers./…….love, happy hiccup of feathers,/the ceaseless melancholy of/the weary spirit, gently corrected.” In a book that is largely serious and introspective, the lagniappe of a chicken poem elicits genuine laughter. 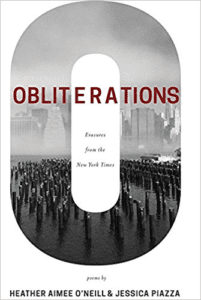 If a title foreshadows the work of the book, Obliterations is a successful title. This is a book length etude, which proves the validity of erasure as a respected form. It puts to rest any notion that found poetry lacks creativity. In contrast, Chelsea Biondolillo’s #lovesongs challenges the notion of what is permissible with found writing, what it means to appropriate language, and who owns the words. This chapbook length collection is comprised of unaccredited found language combined with photographs and original language by Biondolillo. The first of each paired page features what appear to be text messages from former lovers and photographs of birds – dead birds. The second of the paired pages showcases a lyric response from the writer. The text messages can be intriguing – “Leather Shoe/And a Blacklist Blue/A Paintbrush/The Smell of Herbal Glue/Sunglasses/Eyelashes/Chelsea’s Shoe With a Hole/And a Hole in my Heart” – but are mostly trite. 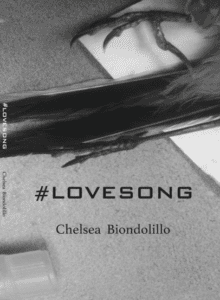 “Chelsea –/ you totally give me heart palpitations in a good way!/Thank you for your complete awesomeness as a person./I am so stoked to be your valentine.” It is Biondolillo’s responses that breathe interest into the found texts. “We take turns tracing one another’s scars,/filling in the skin-thin cracks in our stories.” or “Your skin was a life boat. Your slick and/toothy mouth, a barnacle on my sea-/soaked hip.” The call and response format of text and lyric is reminiscent of the paired call of migrating geese, male “honk” followed by female “hink”. It takes both sounds to create the goose call we know, and it takes both text and response to create a meaningful narrative in these short sections. The third puzzle piece, the bird photography, is arresting. There are birds in various stages of decomposition, birds in dissection, a wing pinioned out and pinned down for examination. Since Biondolillo makes no attempt to separate herself from the language, the photos make us question what she is saying about the nature of romance. That it is transitory? A science project? Festering? Doomed? Perhaps it is all of these. Biondolillo’s glancing citation for the texts is equally puzzling. At what level are we obligated to provide citation? For published work? For anything written (these texts)? For street signs? For conversation overheard on a train? How extensive should this citation be? Educated writers can and do argue over where to set this line, but Biondolillo has drawn hers between formally published and privately written (perhaps with permission from the texters; we are not privy to this information). This is one way to consider who “owns” the language; publication equals ownership, existence in the ether does not. In Obliterations, found poetry finds its full expression, blooming exuberantly within severely imposed restrictions. In #lovesongs, found language serves one element in a collage of written and visual work, and is only as the starting point for the writer’s reflections on the nature of partnership. In a sea of small presses which sometimes avoid found poetry out of concerns around language appropriation, and sometimes dismiss it as lacking originality, these collections challenge those notions and keep found poetry relevant.